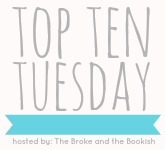 This week's Top 10 Tuesday prompt asks which books do we recommend the most? Oh man, I am a serious book pusher. I love love LOVE recommending books to people. I mean, hello?! It's why I adore doing this blogging thing so much. If I can get one person to pick up a book because I liked it, then score! Mission accomplished. This also extends over into my personal life, and why I am becoming a teacher. Reading is such a huge passion of mine and I value the importance it can bring to an individual's life. I also understand a lot of kids hate to read. But I feel that if I can find that perfect book, for that perfect student, then my job as a teacher is fulfilled as well. 1. Jessi Kirby - I loved Moonglass and In Honor, and cannot wait to share my recommendations for Golden! It's hard for me to choose just one novel by this author to recommend because I feel each of these stories are something so many can relate to. 2. Jennifer Echols - Again, another author who I recommend multiple novels by. Forget You and Endless Summer are two of my older favorites of hers, but Such a Rush is one I recommend to a lot of people now. 3. Jenny Han - The Summer I Turned Pretty series will never grow old being recommended on this blog of mine. It holds everything I love about contemporary YA, from the setting to the cast of characters, it's the complete package and screams GINGER BOOK! 4. Jill Shalvis - Probably the most popular adult author who receives the most exposure on my blog. I love her Lucky Harbor series and have recommended it to countless readers. I have yet to find someone who read it based on my recommendation and not enjoyed it. 5. Megan McCafferty - This was a popular recommendation to me by some of my most trusted blogger friends, so naturally I turned around and recommended her books to everyone I know as well. The Jessica Darling series is perfection, in my opinion. 6. John Corey Whaley - Where Things Come Back blew me away and immediately after reading it, I felt the urge to recommend it to everyone I knew. And I did just that. Corey is an exceptional writer and I want everyone to experience his debut! 7. Trish Doller - This lady knows how to write, simple as that. Before I even read a word from her I had this feeling I'd love it, and that feeling came true.. not once, but twice. I love to support authors and recommend their books to people who can connect on a personal level with them. Trish's books are definitely those kind. 8. Jeri Smith-Ready - After this series was recommended to me, I immediately fell in love with the fandom that surrounded it. Jeri connects with her readers on such a personal level and I admire that! I'm picky when it comes to paranormal reads, but this one felt like everything I love rolled into such an intriguing story. The Shade series is a must read! 9. Rainbow Rowell - I love to recommend this author because she writes both amazing YA and adult. I adored Eleanor and Park, but fell insanely in love with Attachments. I think she's a great author to recommend to any reader type. Her cross over appeal can grab such a wide audience. 10. Huntley Fitzpatrick - I recommended her debut novel so much last year! It was one of my most favorite reads of 2012, so how could I not? My Life Next Door made me laugh and swoon, and all the emotions in between. A book that causes that many feelings deserves to be recommended to others! The Jessica Darling series is one of my favorites too. I don't know how I forgot to put that on my list! Still haven't read anything by Jennifer Echols, but looks like I should soon! Oh yes, definitely read a Jennifer Echols book ASAP!! Woho, there are a lot of books I haven't read but always wanted to ... I love Jennifer Echols and I always wanted to read books from Trish Dollar and Huntley Fitzpatrick! I hope you get a chance to read Something Like Normal by Trish Doller soon. I think you'd really like it! I agree with everything you said about Huntley Fitzpatrick. I also really enjoyed Such a Rush; I'll have to read some more of Echol's books. Whoa, I love that I haven't read any of the books on your TTT, but I will definitely be picking up some Rainbow Rowell soon, I've been seeing that lady everywhere, with only good things attached to her name! Thanks for all the recs! Awesome! Rainbow Rowell is amazing!! What?! Oh Cynthia, remind me to bring you Moonglass the next time we hang out. I think you'd love it! I am completely on-board with lots of your choices. Something Like Normal and My Life Next Door totally blew me away last year. And I really enjoyed Such a Rush but I haven't fallen in love with any of Jennifer Echols other books. Great list! Thank you! I've heard great things about Jennifer Echols' upcoming YA.. maybe that's a book you should try next of hers? This is a great list with some of my favorite authors as well. Yay! They're pretty amazing, aren't they? Attachments is such a great book. I loved it, and I can't wait to read Eleanor and Park soon too. The reason I got the first book of the Lucky Harbor series was because I'd seen your review on the blog and saw how much you loved the series, and knew I'd have to check it out! I haven't read it yet but I'm sure I will love it. Seeing JD on your list just WARMS MY HEART. There are basically only four more authors on this list that I have yet to read - and most of them will be tackled soon, which is pretty awesome. I do trust most of your recs - a lot of the ones on this list have ended up becoming favorites for me too!